It would be more foolproof if it could sync with your accounts, though. 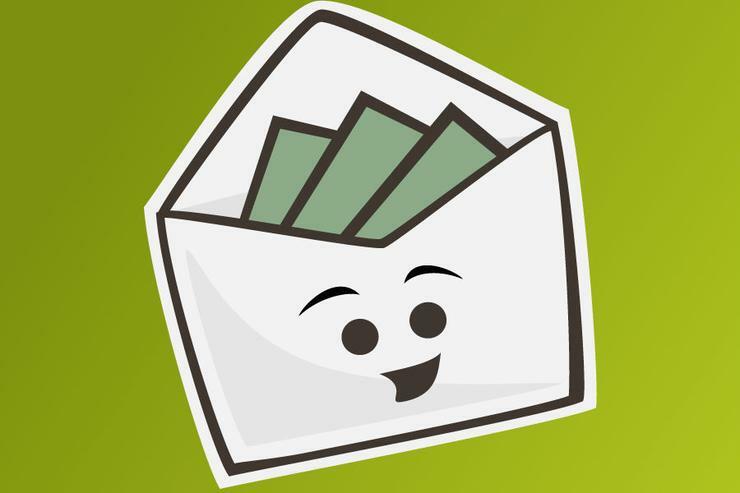 Like You Need a Budget and Every Dollar, Goodbudget uses the envelope system to help you get a grip on your spending. It doesn’t espouse as strong a philosophy as either of those two popular apps, but it does provide an easy-to-follow path to household solvency. Goodbudget’s browser-based interface is pretty straightforward. A pair of tabs on the left sidebar house your envelopes, and your bank accounts and transactions are listed in the main pane. A navigation toolbar spans the top of the screen. To create a budget, you first need to add your envelopes. Goodbudget designates envelopes into two categories: Monthly for your regular expenses and Annual for savings goals and irregular expenses like gifts and insurance premiums. To add more, you just pick the appropriate budget, name the envelope, and set a target dollar amount. Allocating funds to categroized envelopes lets you more easily budget for expenses and savings. 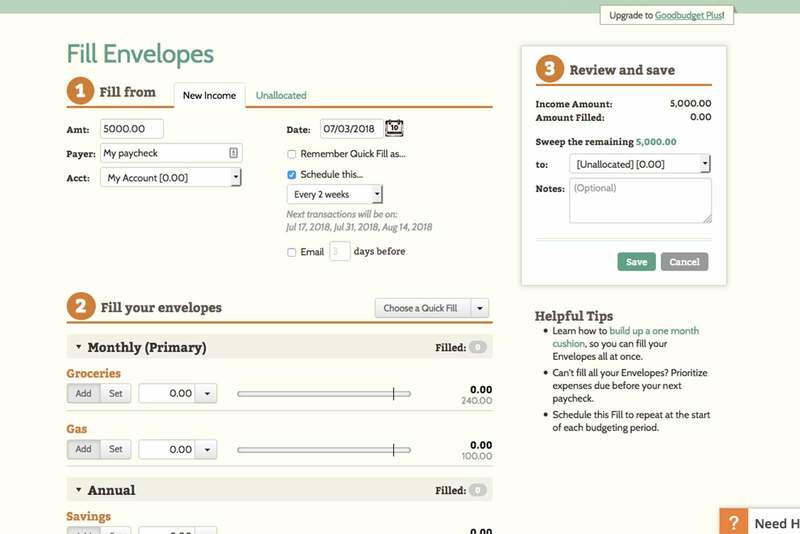 Next you toggle to the Fill Envelopes screen to enter your starting income. If this is a regular paycheck, you can schedule it to populate automatically at intervals—Goodbudget provides a range of options here, from weekly to annually. To allocate funds to each envelope you can either enter the dollar amount manually or have Goodbudget do it for you, in which case it will fill each one with whatever amount you designated during setup from your unallocated dollars. Goodbudget does not sync with your financial institutions, so as money moves in and out of your various bank accounts you have to manually enter the transactions. You can schedule regular expenses like bill payments, and import recent activity by uploading Quicken or MS Money files to save on transactions you have to input by hand, but a certain amount of hands-on attention each day will is required to keep your budget up to date. With each transaction, the appropriate dollar amount is deducted from each envelope. Colored bars give you you an at-a-glance status of each envelope’s balance: green means you still have money in it, red means it’s been depleted. Clicking any envelope from the home screen will list all the transactions for that category in your register. 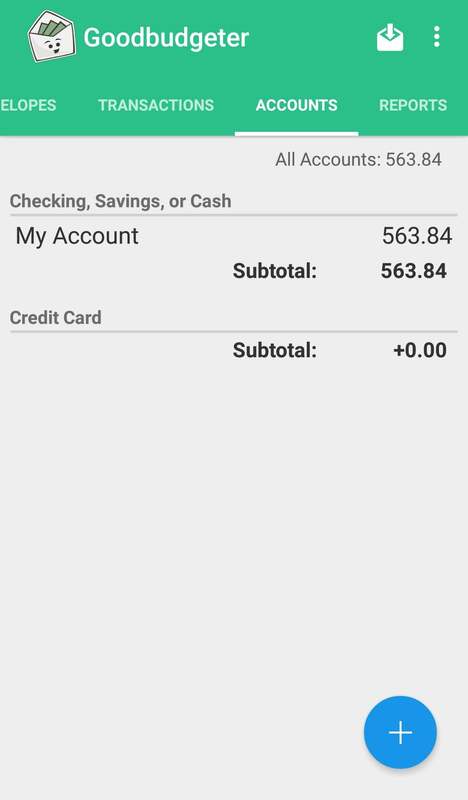 You can sync your budget with the Goodbudget mobile app for Android or iOS. Goodbudget allows you to run several customizable reports to track budget trends, including spending by envelope or payee, monthly spending, and spending vs. income or budget. Each of these is displayed in easy-to-grok graphs. And though it doesn’t provide a budgeting method a la YNAB’s four rules or Every Dollar’s “baby steps,” it does offer helpful tips on how to create a budget, get a month ahead on expenses, and budget toward your values. Goodbudget offers two plans: Free provides 10 monthly and 10 annual envelopes and allows you to log in to your account from two devices, but it restricts you to one financial account. For $6 a month or $50 annually, the Plus plans gives you unlimited envelopes and accounts, lets you log in from up to five devices and adds email support. Both plans let you access your budgets via the web and the iOS and Android mobile apps, though some functions are limited to the browser interface. Goodbudget is a simple, effective solution for individual and household budgeters who want more control over their cash flows. The fact that it doesn’t sync with bank accounts may be a turn-off to many, though. While the degree of hands-on maintenance required might be the trick to keep some user committed to budgeting, it seems just as likely to be an impediment to those who already see budgeting as a hardship. If the latter describes you, you’re better off with a solution like You Need a Budget or Mvelopes that helps out with the heavy lifting.